Frustration with our Casino Healthcare is becoming increasingly common and it often percolates into both social and mainstream media. Sorry, one more on total lack of transparency in HC. I'm at my @onemedical PCP yesterday, we decide on an imagining study I need, he is able to pull up a list of facilities, and what insurances they cover, but: 0 info on cost, 0 info on quality, 0 info on speed. This is nuts. Earlier in the week, Vox published another balanced billing story of an ER visit that resulted in a $5,700 bill — to a patient who had health insurance. As Dave suggested in his tweet, it absolutely does ‘feel’ nuts. But as a system, it’s actually working exactly as designed. In fact, it’s really just a reflection of a system that we’ve built through decades of tax legislation. Through that legislative lens, this is the car we’ve built. Ugliness aside, it’s nearly impossible to drive — which we learn quickly when we get behind the wheel as consumers. A major reason for the increasing angst is that High Deductible Health Plans expose patients to more direct financial risk. We’ve euphamistically referenced this as putting more ‘skin in the game’ as if being a patient wasn’t enough skin. This relatively new design feature had a number of opaque intentions, but the primary purpose was to assign retail or consumer product attributes to healthcare. 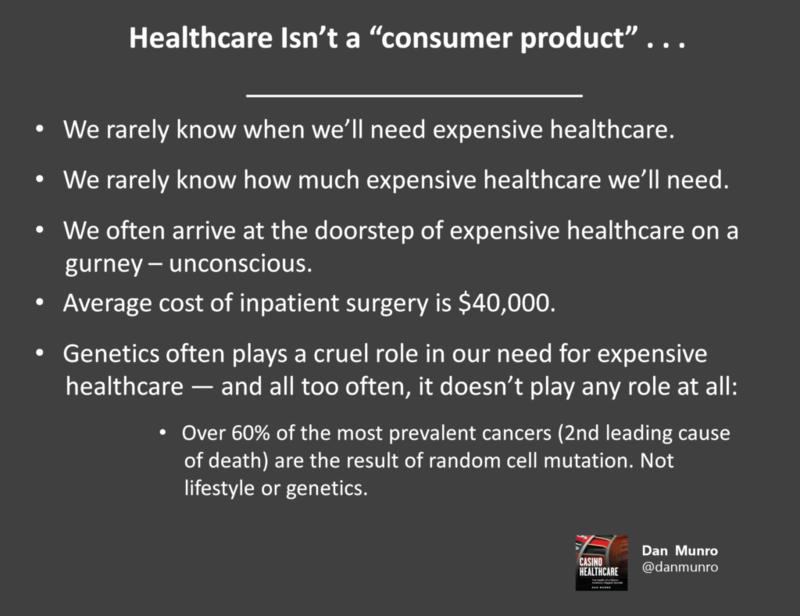 Despite the numerous attempts to force feed this “consumerism,” healthcare never was — and never will be — a consumer product or service. Dave’s tweet is a good lens into unrealistic ‘consumer’ expectations tied to having more ‘more skin in the game.’ Like most consumers, he basically expected an ‘out-of-network’ provider (OneMedical) to be able to give him specific (and custom) pricing for services delivered by a separate provider. The reality of the system we’ve built is that secondary providers (labs, radiologists, etc…) can’t really quote a price without knowing Dave’s custom coverage tier. In effect, and as designed, there’s no way to know Dave’s up-front price without processing a billable claim — in advance. The technical term for this is claim adjudication — and the new consumer expectation is for the system to be able to pre-adjudicate an insurance claim for an exact price before service delivery. Now, maybe the system should be able to do this, but it can’t (or won’t) today. For one thing, the cost to do pre-claim adjudication — while technically feasible — is a major design feature and there’s no real ROI for payers or providers to do this today. Another reason is historic. For products and services that are paid for by a 3rd party payer (the health insurer), why should patients care what the price is? Until the evolution (and growing prevalence) of high-deductible health plans, there’s been no real need for patients to know their (highly variable) price. Our system of opaque and tiered coverage is designed to support tiered and inelastic pricing. A second order problem is even more fundamental. Even if the system could deliver real-time pricing by coverage tier — so what? That wouldn’t change the coverage tier or the highly variable price. You would get to see the price — but not influence it. The only choice would be to agree to the out-of-pocket expense or not to follow-up with the clinical recommendation. In the end, single-payer healthcare isn’t the only solution to end tiered coverage. Single-payer works, of course, but the real leverage isn’t the payment model — it’s the price. We can certainly end highly custom and tiered pricing. We should end it, but that’s a model based on single-pricing and there’s only one coverage model that supports that — Universal Health Coverage (UHC). 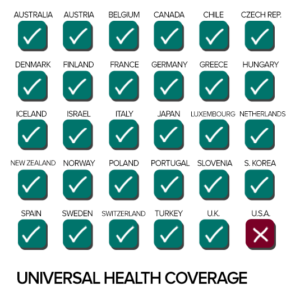 Single-payer healthcare isn’t necessary, but single-pricing is (and why every other industrialized country has adopted UHC). Sorry Dave, our system isn’t nuts at all. It’s just been designed to support tiered coverage — as the way to maximize revenue and profits — and we just need a different system design. Our current design has a simple reply to your question of price. How much you got?